Jewelry is represented as a symbol of femininity and women’s social position. There is the latest trend to wear exquisite different jewelry on formal as well as informal events. The jewelry is made of precious stones, pearls, kundan, and other precious materials. It’s more interesting when skillful jewelry maker creates delicate designs for rings, earrings, bracelets, necklaces, and other fashion accessories & that is being worn at the right place of women’s curvy figure. To wear jewelry has a spiritual meaning that gives drastically benefits in our day-to-day life. Each jewelry has own meaning and gives results according to its property. Who doesn’t like to look beautiful? Nowadays, ladies want to become trendier and follow the latest fashion. Also, emphasize on appearance in order to contrast with men by wearing elegant things according to outfit, shoes or frill. Some ladies prefer to wear bright shades of gems and brilliant piece while others prefer to wear light and delicate jewelry. Few key-factors should consider while purchasing the jewelry like the design, quality, and cost. Design of any jewelry is never fixed as it depends on trend but quality must be checked whether the products are from authorized agencies or have certifications. Although jewelry is the costliest product, pay out the amount according to design and quality. 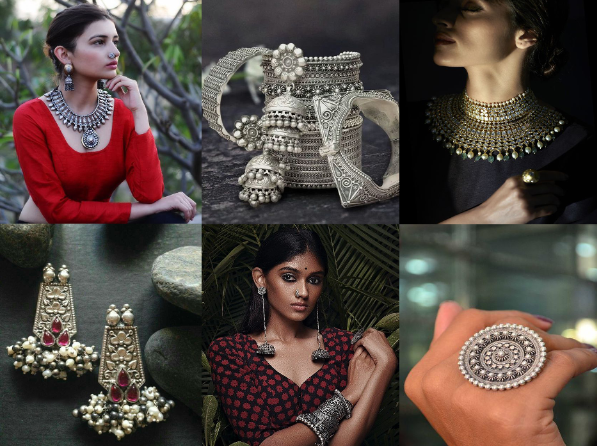 Oxidized jewelry is in vogue as it is affordable & versatile alternate and provide a unique look. Innovative designs of oxidized jewelry tend to harmonies with any complexion so it enhances the appearance of the wearer. Due to the increasing popularity of oxidized silver jewelry, designer come up with restyle. The unique collections of rings, earrings, bangles, pendants, necklaces, bracelets, and other ornaments are extensive. These days, oxidized tikka, armlets, kada, and wristlets are also popular. You can select this jewelry with intricate thread work if you are in search of exclusive designs. Oxidized jewelry can be wear on saree, kurta, indo – western, gown or western attire. This jewelry can be a cheaper option to gift your loved one! 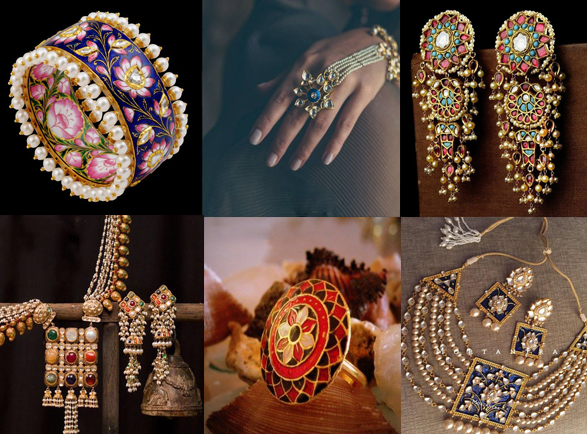 Kundan Jewelry is Indian traditional jewelry which originated from the royal court of Rajasthan. Kundan crafts are a strenuous process that involves several stages and pass through variously skilled craftsmen. It is made of gemstones surrounded in metal with golden foil that gives a rich and royal look to jewelry. Kundan jewelry looks extraordinary when it is mixed with red & green color stones. Rajasthan is a great source of Kundan products if you are looking for elegant items. 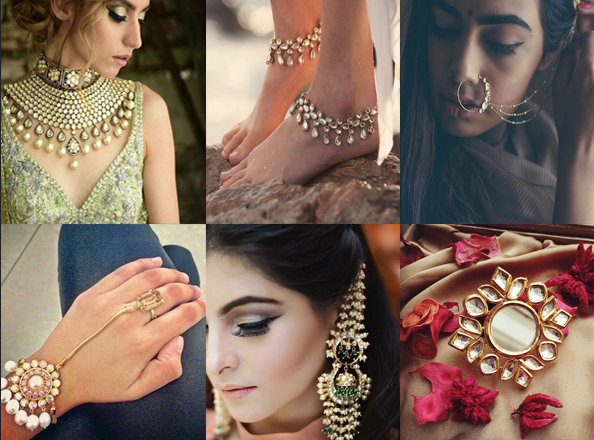 Select varieties of Kundan jewelry like Tika, Nose Ring, Ear-rings, rings, bracelets, bajubandh, and necklaces, payal to wear for gathering functions or events. Jewelry is such innovative field and jewelry designers always bring better products than previous by experimenting with new materials and patterns. Meenakari designs are the process of coating grooves in accessories of brass, copper, silver or gold with colored enamels. 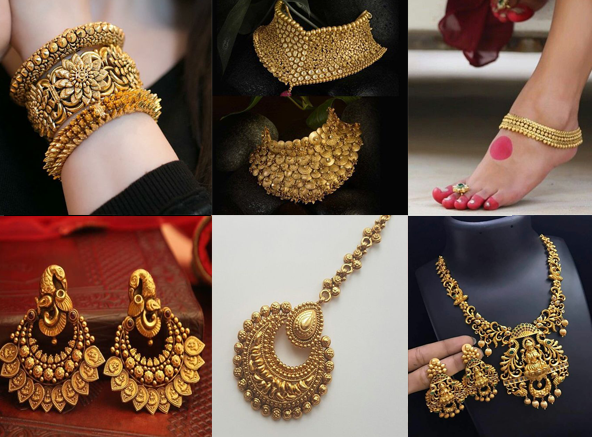 This type of jewelry available in huge varieties so you can pair up with the routine outfits as well as occasional wear cloth but it is mostly choice of bridal due to lovely design and the perfect mixture of modern and traditional designs. It is used to various wedding/event themes for unique appearance because of its distinguishable quality. No ornaments are beautiful than Gold jewelry due to having unique properties that are needed to make it! Gold has a yellow color and natural culture that is worn by every culture mostly. It is used to create the perception of a wealthy background that makes it popular. Gold never tarnish but it has extremely softness that can be overcome by mixing gold alloy with other alloys such as silver, copper, nickel, iron, zinc, tin, etc. to make it strong, durable and usable. Fashion changes frequently and recently, designers bring innovation like white gold that looks similar to platinum but prices are lower than it and rose gold that is a mixer of Gold, Copper, and silver gives appealing & eye-catching style to your body. Brides who don’t like yellowish gold can select white or rose gold for their wedding collections. 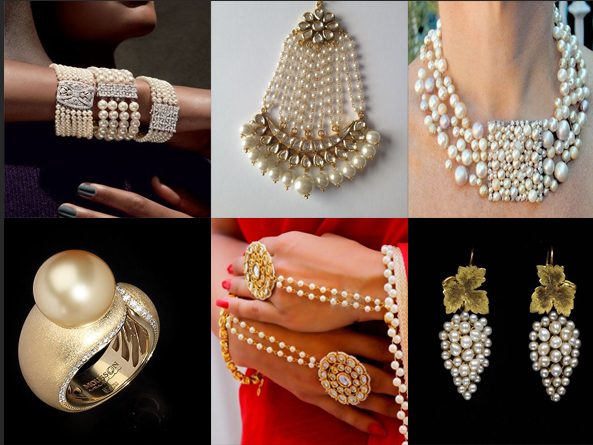 Pearls are very unique and valued gemstone since few decades. It arises from the sea, not from the depth of the earth. The special quality of a pearl is that does not require special cutting or polishing process to enhance its beauty. The trend of pearls won’t be outdated and every lady should have pearls jewelry in their wardrobe as it suits with every outfit. There are numerous pearls jewelry appears in a different style and ways such as necklace, earring, ring, bracelet, etc. Pair up your attires with pearls products to look something different and add grace to your style.